The combination of anchovy and sage is known in Italy as ‘il tartufo di pescatore’ or ‘the fisherman’s truffle’. Add a beautiful buttery whole roast plaice along with waxy new potatoes and salty sea vegetables, and you have a real catch on your hands. Heat the oven to 180°C/160°C fan/gas 4. Toss the potatoes in a large roasting tin with a good drizzle of oil and season with sea salt and black pepper. Nestle the lemon slices among the potatoes, then roast for 40 minutes, turning halfway through, until golden and crisp. Meanwhile, melt the 75g butter in a sauté pan over a low-medium heat and fry the reserved whole sage leaves until crisp, then drain on kitchen paper and set aside. Gently heat the butter in the pan until it begins to brown and smell nutty (don’t let it burn). Add a little lemon juice (be careful as it may spit), then stir in the anchovies and chopped sage. Cook for another minute or so until the anchovies start to break down and the sage turns crisp, then transfer to a bowl and keep warm. Don’t wash the pan. 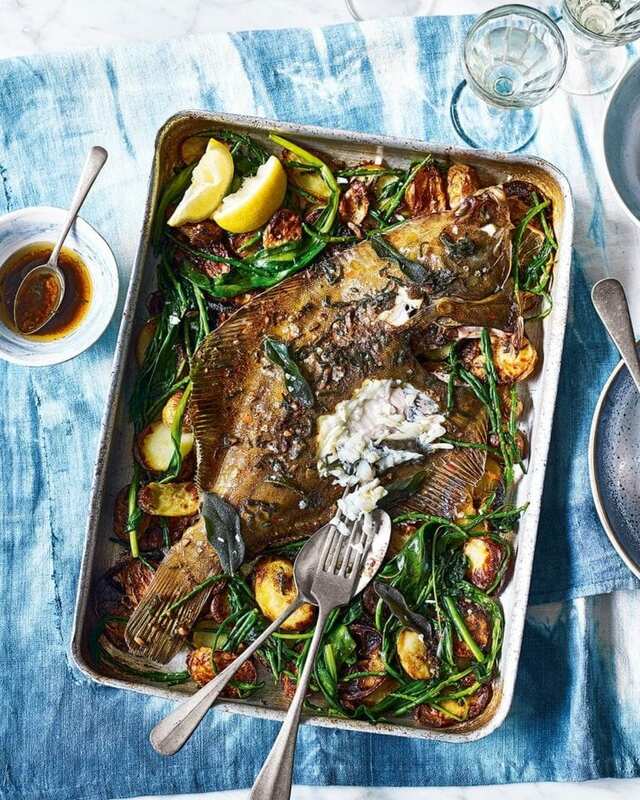 Once the potatoes are crisp, lay the whole plaice on top and drizzle with a tablespoon of the anchovy butter. Bake for 10-15 minutes until the fish is just cooked. When you insert a small knife, the delicate flesh should be opaque and flaky. Heat a small knob of butter in the sauté pan and add the sea vegetables. Cook, stirring, for 3 minutes until wilted, then season with salt and lemon juice. Once the plaice is cooked, arrange the sea veg around the fish, scatter with the fried sage leaves and drizzle with the remaining anchovy butter. Serve with lemon wedges. Sea vegetables are available in Waitrose and Sainsbury’s and from finefoodspecialist.co.uk. We used samphire and sea aster, but if you can’t find any you can use spinach instead. as a fine Graves bordeaux blanc.